Join the Rotary and Kiwanis clubs for a lobster and steak feast and help the many community projects these two clubs support. $75 ticket includes a choice of steak or fresh lobster meal (or $100 for both), with a charitable receipt for a portion of the cost. Live entertainment by "Creek City", cash bar, silent auction, 50/50 and more! Email lobsterfestrk@shaw.ca for tickets or call Theressa at 306-778-2117 or Chad at 306-778-6611. 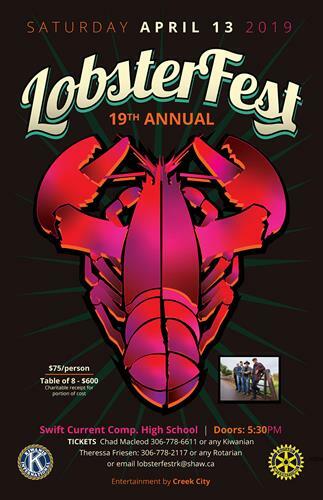 Email lobsterfestrk@shaw.ca for tickets or call Theressa at 306-778-2117 or Chad at 306-778-6611.